Katherine I. Crook is a neurologist at Charleston Veterinary Referral Center in Charleston, South Carolina. She earned her DVM from the University of Florida before completing an internship at a private practice in Connecticut and a 3-year residency in neurology/neurosurgery at North Carolina State University. Her published research focuses on improving current therapy for inflammatory brain and spinal cord disease, and she has a keen interest in neurosurgical procedures. Intervertebral disk disease (IVDD) is the most common cause of spinal cord injury in dogs and it can also occur in cats.1,2 IVDD commonly occurs in dogs and can have profound consequences, including pain and weakness. In some cases, disk disease can lead to intervertebral disk herniation (ie, disk degeneration that results in abnormal displacement of the nucleus pulposus and/or annulus fibrosis into the spinal canal). Hansen type II IVDD is most commonly observed in patients identified by which of the following signalments? Nathan, a 5-year-old neutered dachshund, is presented with pain and inability to walk of 2 days’ duration. His owners are not aware of any recent trauma. Careful neurologic examination reveals that the dog is paraplegic with intact nociception (superficial and deep pain) in the pelvic limbs and tail. What is the most likely cause of this dog’s deficits? IVDD is classified into types: Hansen type I and Hansen type II. Intervertebral disk extrusions are commonly referred to as a Hansen type I IVDD or type I IVDD.3 This type of disk displacement has acute onset and occurs most commonly in chondrodystrophic breeds (eg, dachshund, Pekingese, beagle, basset hound, Welsh corgi). In dogs with Hansen type I IVDD, a portion of the nucleus pulposus herniates, or extrudes, through the fibrocartilage of the annulus fibrosus into the spinal canal. Disk material in the spinal canal can then cause compression of the spinal cord. The pain, paresis, or paralysis associated with type I IVDD depends on the degree of compression. Traumatic disk ruptures and fibrocartilaginous embolism cause a peracute loss of function. Patients with these conditions may experience minimal progression of signs in the first hour after the initial injury, but generally these signs are nonprogressive. Hansen type II IVDD is incorrect, as this type of disk disease is more chronic in nature and most often occurs in older, nonchondrodystrophic canine breeds. 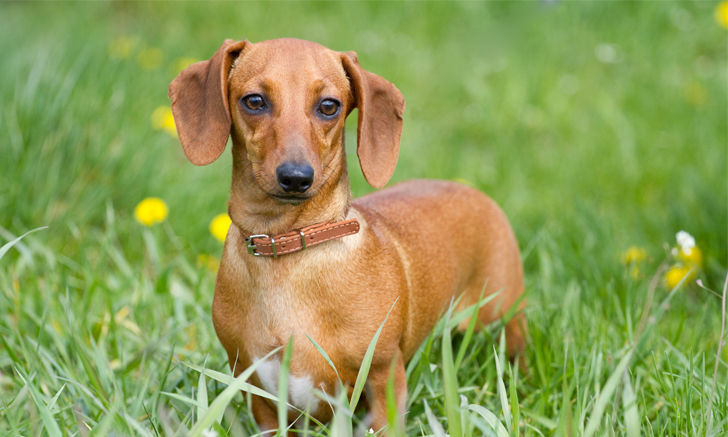 Regarding the dachshund discussed in question 2, what is the dog’s predicted prognosis for return of ambulation? Nociception (ie, perception of a noxious stimulus) is the principal clinical sign on which prognosis is based. Because this patient still has nociception, his prognosis for functional recovery is considered excellent when treated surgically. Patients with loss of nociception have an extremely guarded prognosis for return to ambulation with medical management alone and an approximately 50% to 58% chance of return to ambulation with surgical intervention. For further reading, a chart summarizing success rates comparing medical and surgical intervention based on the severity of neurologic deficits may be found in the most recent BSAVA Manual of Canine and Feline Neurology (see Suggested Reading). Which of the following is not a commonly reported sign of lumbosacral disk disease in dogs and cats? Dogs and cats with lumbosacral disk disease typically avoid sitting. Which of the following should not be used to describe an acute noncompressive disk extrusion or prolapse? For which of the following diagnoses is medical management not indicated? Medical management is highly successful in ambulatory patients and in those with nonrecurring spinal pain.4 Appropriate medical management includes 4 to 6 weeks of strict rest in combination with oral analgesics (eg, gabapentin [5-10mg/kg PO q8h] and/or tramadol [2-4 mg/kg PO q8-12h in dogs and 1-2 mg/kg PO q12h in cats]) and anti-inflammatory drugs (an NSAID or a steroid). Patients should be closely monitored for any evidence of neurologic decline. If a patient does not improve in 7 to 10 days of appropriate medical management or the patient’s condition worsens, surgical intervention is strongly advised. Which of the following is not an appropriate method for obtaining a definitive diagnosis of disk extrusion in a 4-year-old dachshund? Survey radiography of the spine helps screen for evidence of disk extrusion, based on such changes as narrowed disk spaces and presence of mineralized disk material. However, this method is relatively inaccurate in correctly identifying the exact side and site of maximal spinal cord compression. Further imaging studies (eg, myelography, plain CT, CT myelography, MRI) are necessary for definitive diagnosis and accurate surgical planning. A CT scan is rapid and more accurate at identifying the most significant site of spinal cord compression than myelography alone. In addition, neither CT nor MRI has the potential complications (eg, seizures, infection, hemorrhage) associated with myelography. Both CT and MRI allow visualization of the spinal cord and associated structures in multiple planes; however, MRI provides more soft tissue detail than does a CT scan. In an emergency setting and in patients with signalment and history strongly supportive of a ruptured disk, a CT scan is often prioritized, as it is considerably more rapid as compared with MRI. However, MRI has the added advantage of providing information involving architecture of the spinal cord parenchyma and identifying secondary changes (eg, edema, infarction, syringohydromyelia), which could have a bearing on prognosis. Coates JR. Intervertebral disk disease. Vet Clin North Am Small Anim Pract. 2000;30:77–110, vi. De Decker S, Warner AS, Volk HA. Prevalence and breed predisposition for thoracolumbar intervertebral disc disease in cats. J Feline Med Surg. 2017;19(4):419-423. Hansen HJ. A pathologic-anatomical study on disk degeneration in the dog. Acta Orthop Scand Suppl. 1952;11:1-117. Hoerlein BF. Intervertebral disc disease. In: Oliver JE, Hoerlein BF, Mayhew IG, eds. Veterinary Neurology. Philadelphia, PA: WB Saunders;1987:321-341. Jeffrey ND, Levine JM, Olby N, Stein VM. Intervertebral disk degeneration in dogs: consequences, diagnosis, treatment, and future directions. J Vet Intern Med. 2013;27:1318-1333. Olby N, Levine J, Harris T, Muñana K, Skeen T. Sharp N. Long-term functional outcome of dogs with severe injuries of the thoracolumbar spinal cord: 87 cases (1996-2001). J Am Vet Med Assoc. 2003;15:222(6):762-769. Funkquist B. Decompressive laminectomy in thoraco-lumbar disc protrusion with paraplegia in the dog. J Small Anim Pract. 1970;11(7):445-451. Brisson BA, Moffatt SL, Swayne SL, Parent JM. Recurrence of thoracolumbar intervertebral disk extrusion in chondrodystrophic dogs after surgical decompression with or without prophylactic fenestration: 265 cases (1995-1999). J Am Vet Med Assoc. 2004;224(11):1808-1814. De Risio L, Thomas WB, Sharp NJ. Degenerative lumbosacral stenosis. Vet Clin North Am Small Anim Pract. 2000;30(1):111-32. Levine JM, Levine GJ, Johnson SI, Kerwin SC, Hettlich BF, Fosgate GT. Evaluation of the success of medical management for presumptive thoracolumbar intervertebral disk herniation in dogs. Vet Surg. 2007;36(5):482-491. Platt S, Olby N. Success Rates for medical versus surgical treatment in dogs with thoracolumbar intervertebral disc disease. In: Platt S, Olby N, eds. BSAVA Manual of Canine and Feline Neurology. 4th ed. Hoboken, NJ: Wiley-Blackwell; 2013:308.